This article is from the Winter 2002 AFRMA Rat & Mouse Tales news-magazine. QHello. My name is Nicole Thorne. I am 9 years old. I would like to know about Black Banded mice. How many babies do they have? What do they eat? 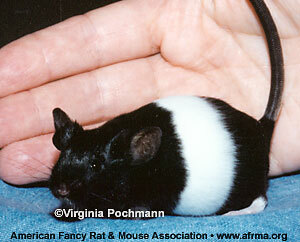 How come they are called Black Banded mice? Where do they live? How big are they when they are first born and how old are they when they die? How many years can they live? Thank you for reading my letter. AMice can have anywhere from 1–20 babies, the normal-sized litter is 8–10. When mice are born they are around ½ to ¾ inch long. Mice live an average of 1–2 years. Mice eat a variety of foods. The best food for them to have all the time is Lab Blocks (Lab Pellets/Lab Diet/Rodent Blocks). This has everything in it that they need. It is like feeding your dog its dog kibble. Mice will also eat seed/grain mixes, uncooked oatmeal, whole wheat bread, dog biscuits, and some fresh vegetables like carrots. These foods should be given as treats a couple times a week while the lab blocks are kept in the cage all the time for your mice to eat. The best kind of house to keep your mouse in is an aquarium (10-gallon size so you have lots of room for a house, wheel, and toys) or a jumbo-sized plastic carrier. Most wire cages are made for hamsters or rats and mice can get their heads between the bars of the cage and get stuck. Banded mice are called “Banded” because of the broad white band around their middle. They were introduced to the Fancy by Frank Ansell in 1988.